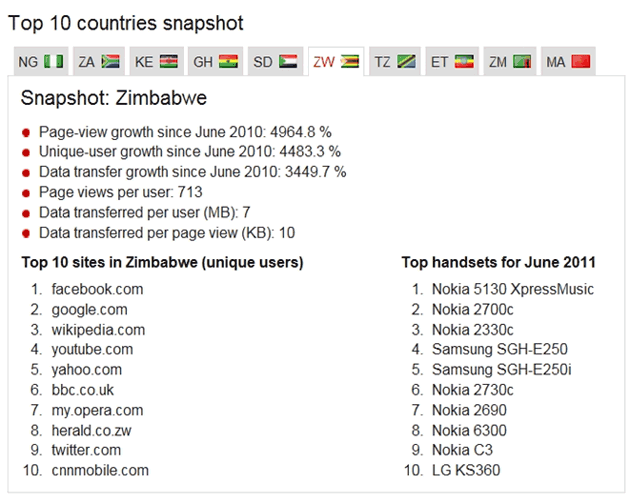 In terms of growth Zimbabwe was ranked as the fastest growing market in terms of page view growth, unique visitors, data transfer. The report’s biggest highlight for Zimbabwe is that the country is the biggest overall African market in terms of page views per user. 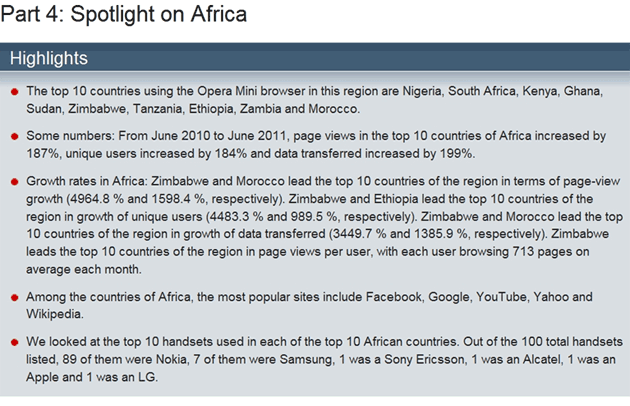 Mobile internet users in Zimbabwe view 713 web pages on average per month. What this says for us here at Techzim is that there is a massive hunger for VAS (Value Added Services) and relevant content. Zimbabwe only has 12.5 million people (the lowest population among the top ten), and yet managed to beat Nigeria (156 million), South Africa (50 million) and other giants of Africa in terms of usage per user. Update: As discussed below with Tapiwa; Zimbabwe’s leadership position as the leading page views per user market for Opera in Africa is not directly significant in the context of population per se. It rather has more relevance where literacy and the hunger for information is concerned (quality of population). Zimbabwe beat all African markets and hot emerging markets around the world (Brazil,India,China) in this area. Only Russia ,Belarus and Ukraine( former USSR state) have higher page views per user in the report. They all have Russian sites dominating their top ten list . This clearly affirms Zimbabwe’s potential as an ICT and BPO services hub on a GLOBAL scale. Very informative post keep it up! Zimbabweans are very unproductive. all top 10 websites viewed in Zim are so unproductive. what are we using the web for. @ClintonMutambo:twitter – math misinformation in the last paragraph. Population size does not have a bearing on any per user metric (because you are dividing by the number of users). If anything, it makes comparison easier between countries with different populations. I get you taps, usage per user and the size of the market are separate aspects. In this light l’d naturally expect users with more access options (in bigger markets), and cheaper rates to consume more. When users in the smallest market (and least competitive) with some of the highest access costs in the group consume more content than those with more options it should tell us something…Rather than population figures, it says something about the quality/literacy of the population. I bet we’d have way more “page views per user” if our internet was reliable and always on…but currently with what Im experiencing with econet and powertel my Internets full potential is not being realised. Is this then not a violation of privacy if you go on to assume big brother role and monitor ones activities on the web, vis a vi, what else are you not showing on these reports.